Okotoks Living magazine, the original Okotoks lifestyle publication, was first published by Source Media Group in the summer of 2009 in collaboration with the Town of Okotoks. Since then, this quarterly magazine about living, working and playing in Okotoks has been embraced by readers and advertisers alike as an important part of the fabric of their community. Okotoks Living is all about positivity and connectivity. It’s about all the people, places and things to do that make Okotoks such a great place to live. There is no bad news in Okotoks Living. Ever. 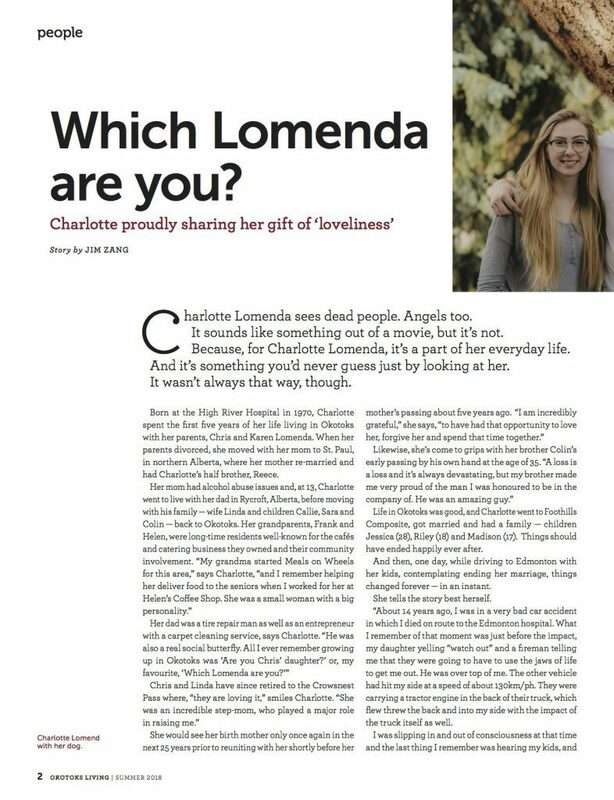 And that’s what made Charlotte Lomenda a perfect ‘fit’ for the ‘People’ feature article in our Summer 2018 edition. Not only is she a descendant of long-time Okotoks residents, but she’s got an incredible story of her own to tell and a uniquely positive outlook on life. From her near death experience, to walking and talking with angels, to raising a family and running her own businesses – Charlotte is a living, breathing reminder of the power of positive thinking.